Where can I get a hexadecimal or binary calculator? Where can I get a hexadecimal or binary calculator that will help me manage hex and binary numbers? 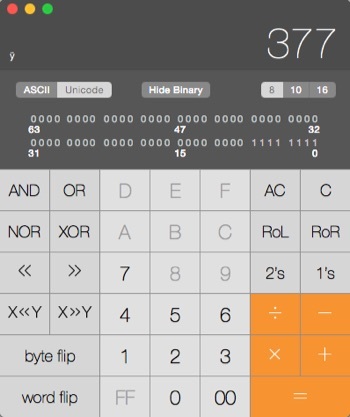 That's just the standard Calculator App on Mac OS X after hitting Command+3. The standard Windows 7/8 calculator has a very similar switching capability. On Linux, most people recommand qalculate. There is a whole pile of choices on Android - just Google! There are also many listed in the IOS App store, but Pcalc seems to be the clear leader. You can add a $2.99 Programmer Pack to the free Lite Version or get the full version (which includes that and more) for $9.99. The Calculator in Windows 7 & Windows 8 - A Tool for the Geek in You! -> Where can I get a hexadecimal or binary calculator?